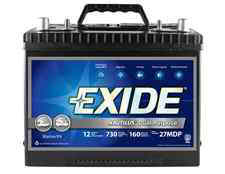 Exide Batteries has a single-minded focus when it comes to marine batteries: reliability. Whether you're a bass angler, race high-powered sports boats or sail the oceans, there's a Nautilus Gold deep cycle battery for trolling motors and for your power hungry accessories. The Nautilus Gold is available in standard through heavy-duty grades is is backed by a strong nationwide warranty. · Twin stainless steel terminals connect quickly, resist corrosion and allow multiple attachments.